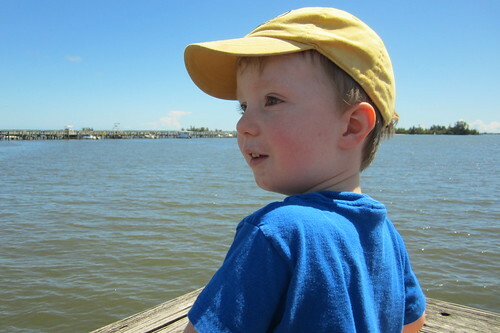 Today we went to the beach, which I think is only Evan's third trip ever to the ocean. He's always been overwhelmed and fearful of it. He was willing to get closer this time but still didn't want much to do with the water. But he was totally fine walking with me along the surf. We were close enough that the water would wash over our feet occasionally. When the foamy salt water would get close, Evan would exclaim, "See bubbles!?!" We stopped and picked up shells. I admired the first and thought maybe he would want to hold onto it--his big brother was collecting shells elsewhere on the beach--but Evan decided to just chuck it into the ocean. Then he found a few more and did the same thing. While he had his own idea about the shells, he also insisted that I hold his hand the whole time, which I happily obliged. 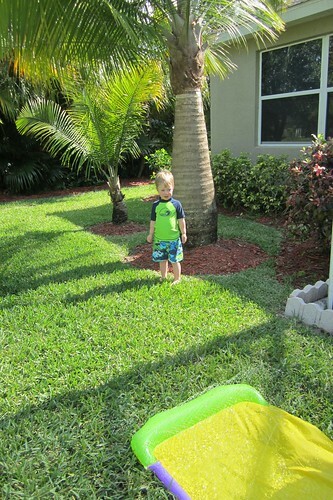 Evan may need some time to warm up to a new activity--like playing in the pool or at the beach this week--but he is almost always open to an adventure. 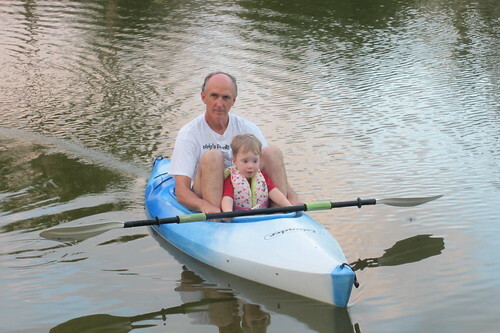 When I started talking about our upcoming trip to Florida a couple weeks ago, he started insisting: "I wanna ride boat with Granpa!" Indeed he has almost every day that we've been here. 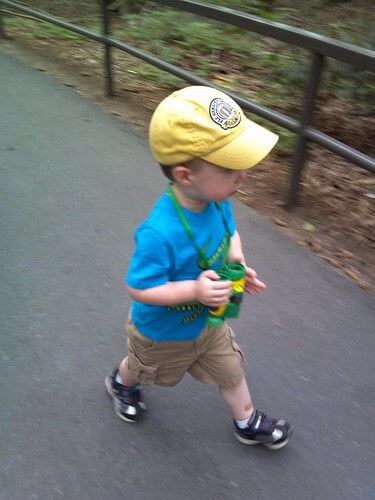 Vacationing this week has really shown how much he's growing up--and how quickly. He's suddenly able to handle stretching his schedule with late bedtimes and the occasional missed nap. He sleeps on a pallet next to Tobin's bed in a separate room from me and doesn't have the trouble sleeping that he did last year around this time. I'm increasingly thinking of him as a big boy now, simultaneously enjoying and lamenting how he loves playing and being with people other than his mama. 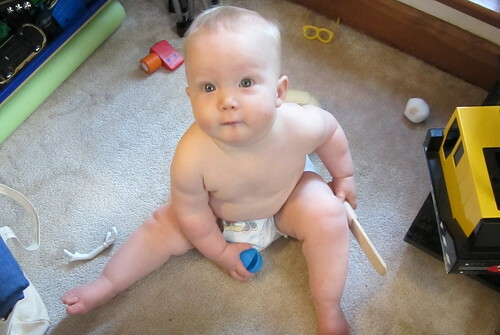 As he approaches the end of his third year, Evan appears well on his way to figuring out the potty. After many months of expressing not just disinterest but outright disdain for the practice of peeing in the potty, Evan is doing so regularly these days. 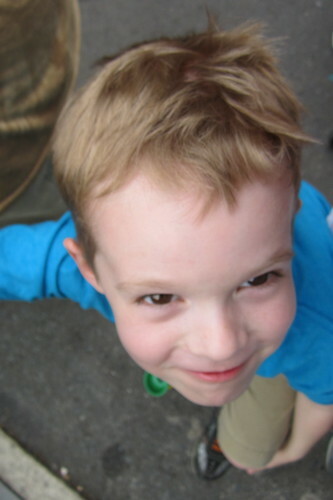 With Tobin, I used a fairly complicated incentive system involving M&Ms and Matchbox cars to encourage potty training. I gave Evan chocolate chips as rewards for the first few days but he quickly got into the routine and seemed much more excited about getting to flush the potty and our cheer of "Yay Evan!" (Yes, he says it too.) than receiving any kind of treat. While neither of us love this whole potty training thing, I know I'm enjoying watching him figure it out--in his own way. He is my baby boy growing into another big boy, but forging ahead with his own very distinctive style. The kids and I are spending the week in Florida with my parents. While there was much to look forward to, I also faced the trip with some trepidation. We left Matt behind, which is always hard. And of course, that meant I had to fly with three kids by myself: one nursing, one potty training and one who chews gum and then drops it in his lap to eat pretzels and peanuts on the plane and ends up smearing said gum all over the seat of his shorts and the airplane seat. 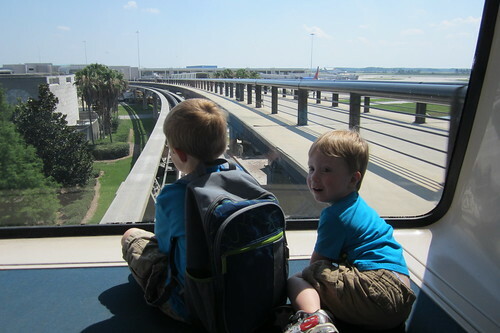 Except for the gum incident, the 90-minute direct flight went well--thanks in large part to having two game-playing devices for the boys. Evan even peed in his first public toilet (in the airport restroom, not the airplane lavatory--thank goodness I didn't have to visit the latter). We're missing Daddy but loving our time with Mimi and Granpa, wearing our swimsuits and sunscreen every day and staying up past our bedtimes but faring very well. I may write more about our visit next week, but for now enjoy the pictures I'll be posting here. 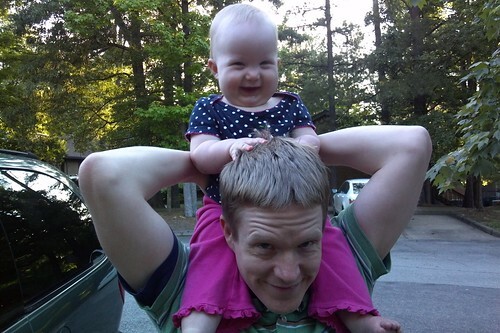 Six years ago I gave birth to a beautiful baby--just four days after receiving my law school diploma. 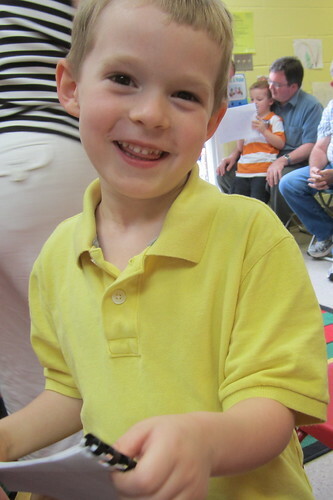 And somehow that baby is now this boy old enough to have his Kindergarten diploma. Today was an especially gorgeous one: 70-degree temps, breezy and sunny--pretty much perfect for celebrating Tobin. 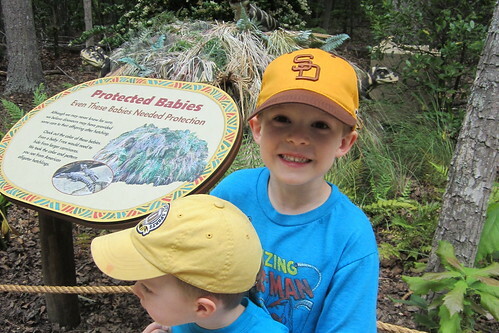 We've been celebrating for a while, with his NCAA tournament trip, school celebration and zoo visit. But today was also special, very simple and family centered. It happened to also be Tobin's first day of summer break. Matt had to work today but he got up early to make Tobin coffee cake for breakfast. Tobin woke at his usual 6:30 and smiled widely at the new baseball glove from us and new bike from Grandma. I fretted a little that we should have gotten him something else--something that he could play with immediately--but characteristically, he started playing catch with Evan, who was thrilled that Tobin's old baseball glove was now his glove. (Evan also gets a new-to-him bike!) We put a candle in Tobin's coffee cake and sang to him. He smiled sweetly but did quiz me a little afterwards about why there was only one candle; I mean, he is six after all. I reminded him that there will be more candles tomorrow on his official cake, which we'll share with some friends. 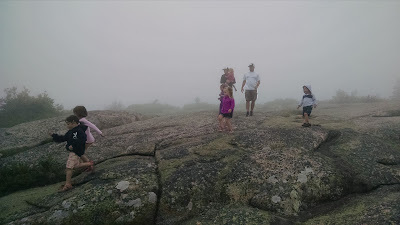 The kids and I spent a fairly typical, low-key morning. Of course, "typical" is only "low-key" in the sense that we're all kind of used to a certain level of chaos. Right after singing "Happy Birthday" to Tobin, I ran to fetch Evan from his crib to try to get him to the potty in time. Then later, Tobin asked for another piece of coffee cake, but I told him he'd have to wait a few minutes as I'd just sat down to nurse Lauren. He takes all of this shared attention in stride, which in and of itself helps me so much. Beyond that, he's my helper, mostly taking care of himself and even keeping tabs on his younger siblings when I have to be in another room. 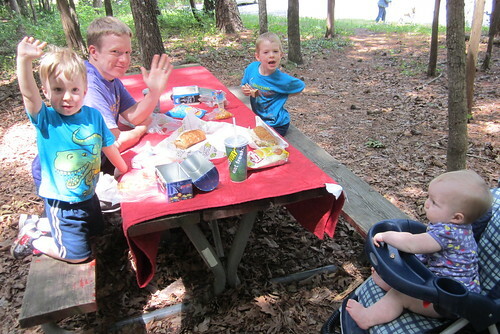 We took advantage of the weather and made the most of Daddy having to work by meeting Matt for a picnic lunch at a local park. 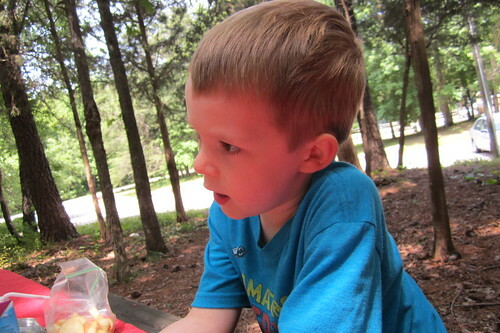 Tobin was pretty excited to have a picnic for the second day in a row as we'd just had a picnic lunch at his school. After that we went home, the babies napped and Matt came home too just a couple hours later. Tobin spent a good part of the afternoon building Angry Birds out of Duplo blocks. He spent as much time explaining to me each one's "special power" as he did constructing or playing with them. That's so very characteristic of Tobin, he is imaginative, independent and detail-oriented in his play. We finished the day with homemade pizza and then a trip out for frozen yogurt. 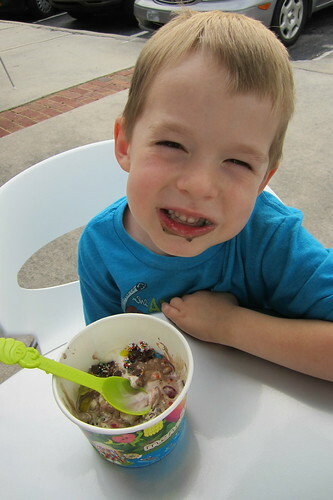 Tobin loves the possibilities offered by self-serve yogurt and toppings. I think he had lemon, chocolate and vanilla yogurt topped with close to ten different confections, including sour gummy worms. He loved it! Tobin stayed up a little past his bedtime so we could play a game of Qwirkle. Whenever one of us would get a high-score tile placement, he would compare it to past high scores, dating back to Christmas when he got the game. Apparently, Grandma and Uncle Dan are Qwirkle rockstars. 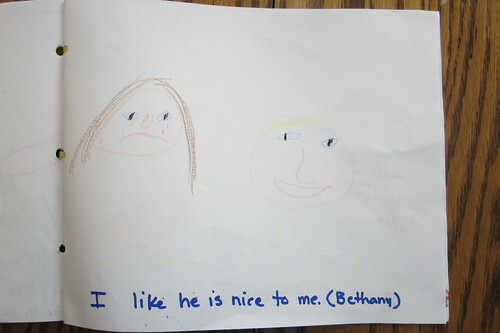 The bittersweetness of this birthday has been especially acute for me, as it's coincided with the end of Kindergarten. 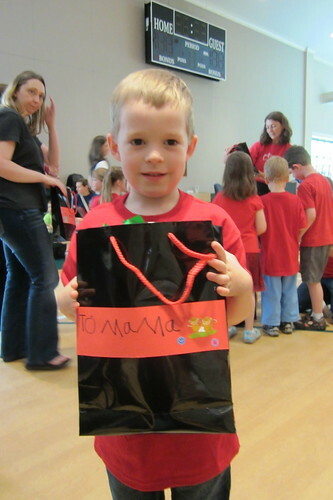 I'm sad to say goodbye to his wonderful teachers and sweet friends. And I'm a tad panicked at how quickly he seems to be growing up! But the flip side of that of course is how much fun he is having--that we all are having along side him. It's also been incredibly special to hear from his teachers and friends about how much they have enjoyed their time with him. Earlier this week at the zoo, we'd been there maybe fifteen minutes and were looking at our third animal exhibit, the ostriches, when Tobin exclaimed: "Man, this place just keeps getting better and better!" Matt and I must have laughed a little because Tobin looked at us confused and asked: "What?" We said something like, "We're just happy you're happy." Indeed we are. While this week is very Tobin-centered, I doubt he would mind sharing the spotlight with his baby sister. You see, Lauren is a big brother magnet. Some days it seems that the only thing Tobin and Evan can agree on is their affection for her. When I bring her in to the bathroom all ready for bed, they will pause every so briefly from their bath time squabbles and blow her kisses goodnight. Just yesterday, we were at a playground and they both wanted to push her on the swing. So for a little while, I let Tobin push from behind and Evan stand in front. 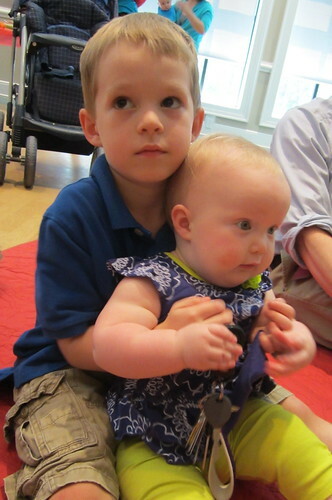 I had to cut off this tag-team approach when it got too rambunctious, but they all--especially Lauren--loved it. She is thrilled to be increasingly part of their world, getting to do things like ride in the race car grocery cart with Evan and play with the balloons we bring home from the store. Being in the mix with her brothers does involve the occasional conflict too. Tobin is old enough to understand she's just a baby, and he "shares" according to her "rules" and is always gentle with her. 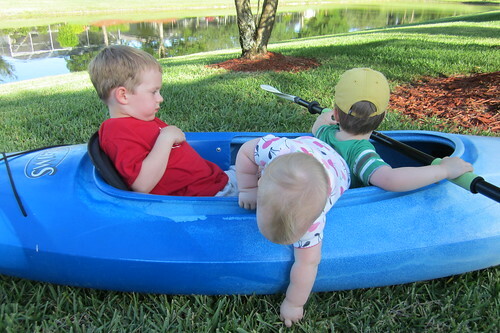 But Evan does not appreciate having another competitor for "Ebban's toys." And when he takes something from her--which is like the most objectionable thing you could ever do to an eleven month old--she gets mad! I've even seen her mouthing Evan in a manner that I fear portends biting. Evan is lucky she only has two bottom teeth, and more often than not he ends up laughing because the only injury he suffers is getting slobbered on. I watch all this carefully with concern, and intervene to correct Evan when he takes her toy or, worse, pushes or hits her. But I know that since the two of them are not quite 24 months apart, they're going to have trouble sharing and being kind sometimes, so there's part of me that is amused that she's showing signs of fending for her self. 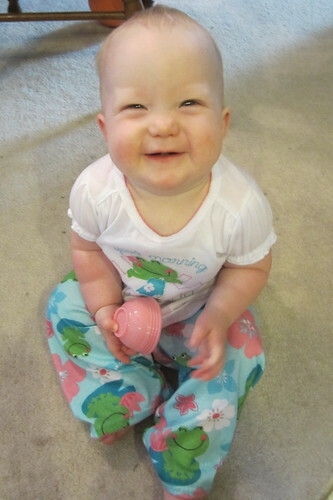 Given her ever-improving mobility, Lauren's life is so much fun! In fact, I'm pretty sure that the excitement of life was what gave her (and me) an especially tough time sleeping this past month. She just seemed to have trouble settling down for naps and nighttime plus had frequent night wakings. I did what I could with extra soothing at these times but when she would get even more riled up and then, sometimes, bite me during these extended nursing sessions, I would simply put her in bed. And there was a stretch there where she seemed to cry herself to sleep (hardly ever more than ten minutes) for each nap and bedtime. I just tried to be as consistent as I could with her schedule and eventually things settled down. 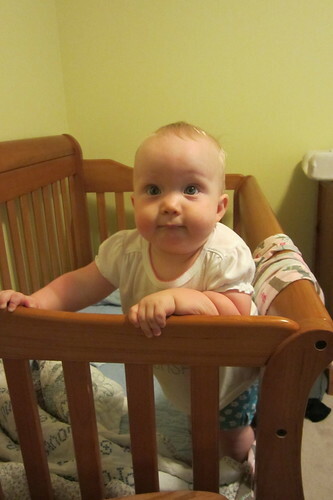 She's in a mostly good sleeping stretch now, which has been good for both of us, but she's just learned to stand up in her crib so I'm a little wary of what's ahead. Still, Evan is a better sleeper than Tobin was, and I'd say she's better than Evan, so I'm choosing to hope for the best! Overall, I continue to marvel at what a happy child she is. 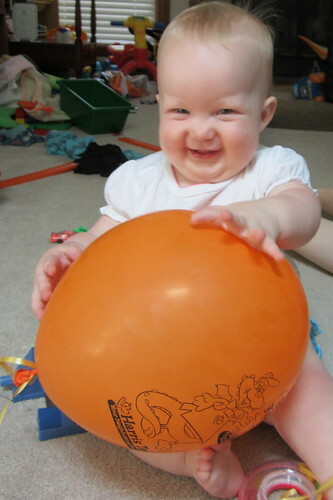 I mean the boys were happy babies too, but this one, she's extra joyful. She tags along on all our family adventures so well--even when it means missing a nap, or lots of time in the stroller or Ergo. As if she needed to further endear herself to Matt, she's started crawling to find him almost anytime he plays music--whether patting the ukulele he's strumming or reaching for him to dance with her in his arms when something is playing on our stereo. She's got us all thoroughly charmed, and we eagerly anticipate her first birthday next month--even if we can't quite believe it's almost here. 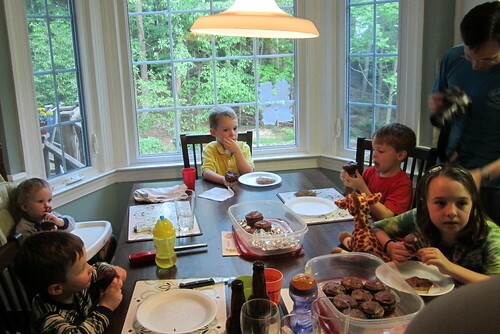 Today all five of us gathered in Tobin's small school classroom to celebrate his completion of Kindergarten. Joining us were the families of his twelve classmates, including plenty of younger siblings. There was definitely a sweet energy in there. 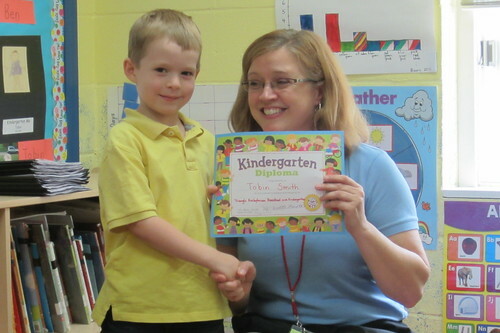 At this simple celebration, Tobin received his Kindergarten certificate from his teacher Ms. Alana Scott and shared a book he wrote first with us and then with the entire room of people. 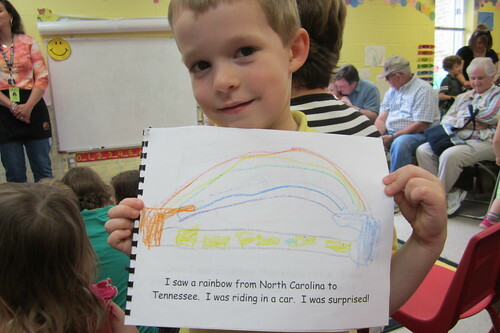 Tobin's book was about traveling with his family--about seeing rainbows and taking four airplanes in one day. When Ms. Alana said that the kids had the option of reading to the entire class, I'll admit I thought Tobin would prefer not to read in front of forty-plus people. I mean he's confident as can be with us and other people he knows well, but he occasionally kind of freezes up if he's not comfortable with a situation. 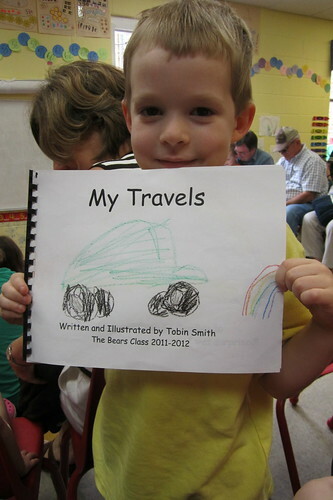 So I was a bit caught off guard when he sat in the reading chair in front of all those people and confidently, with great projection, read the cover of his book: "My Travels, written and illustrated by Tobin Smith, The Bears Class 2011-2012." It made my heart swell with pride and gratitude for Tobin and his school experience these last couple years. When I asked him how he felt reading in front of everyone, he said something like, "Well, I was used to it because we practiced, Mom." Here's a portion of his reading, replete with some Evan commentary if you listen closely. We're soaking up the springtime in an especially sweet (busy) stretch around here between T-ball, birthday celebrations and the end of school. Over the weekend, we had a pair of fun family days. On Saturday, Tobin's little league held their annual Slug Fest fundraiser. Players earned up to twelve swings based on the amount of donations they raised and then were awarded points for the types of hits they got. Thanks to the generosity of our out-of-town family, Tobin took twelve swings. While he could have taken swings from the tee, he chose to have Matt pitch to him. 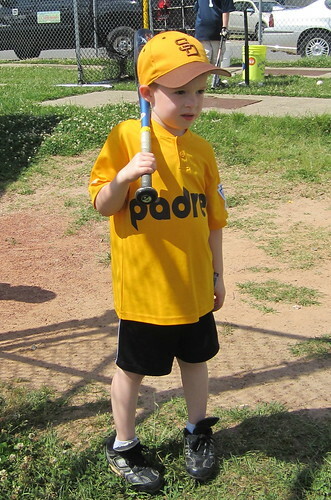 He had a good time and was impressed that his teammate Caden won the T-ball division trophy. 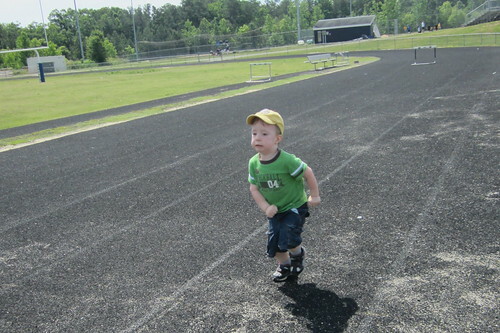 After Tobin was done slugging, we hung out and let the boys run around on the adjacent track. 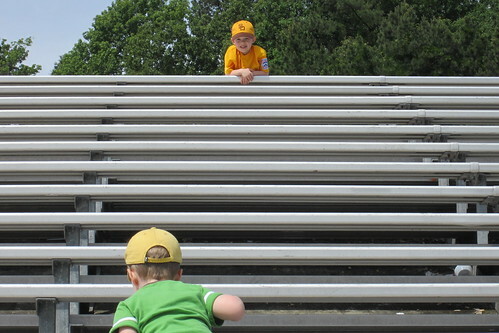 They also climbed the football field bleachers for quite a while. We finished up the morning eating a free lunch while watching players in the older divisions hit. 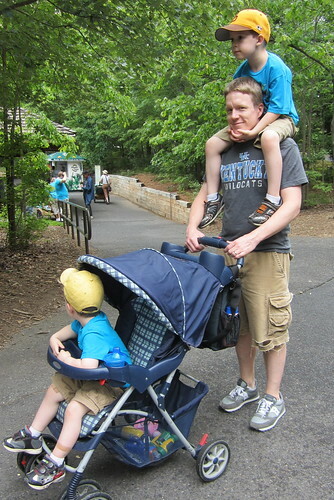 Yesterday, in honor of Tobin's birthday we traveled 66 miles to visit the North Carolina Zoo in Asheboro. 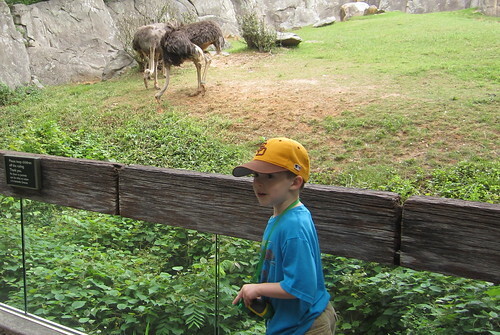 He enjoyed sharing facts about the animals we saw--like how ostriches can run faster than any other birds! 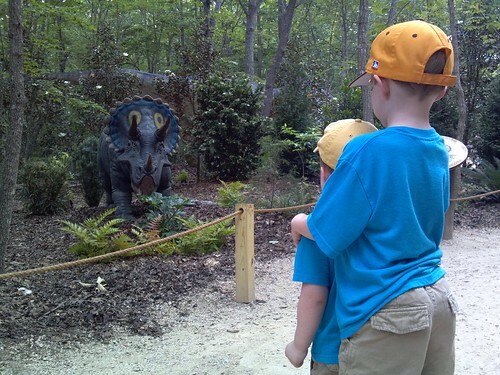 The boys loved the special dinosaur exhibit, which included large-scale mechanical dinosaurs. Matt and I were amused that they were so excited about the "fake" dinosaurs--creatures they found to be "scary" enough that they sometimes wouldn't stand next to them long enough for us to take pictures. 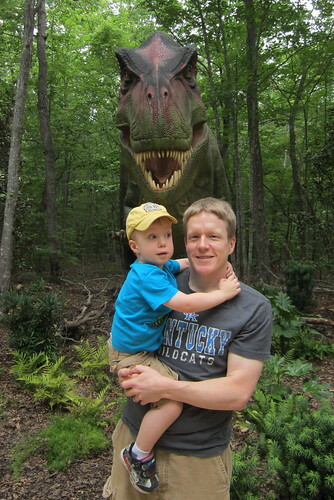 Evan really didn't like even looking at the T. rex and clung to Matt, but at least it made for a good father-son picture. 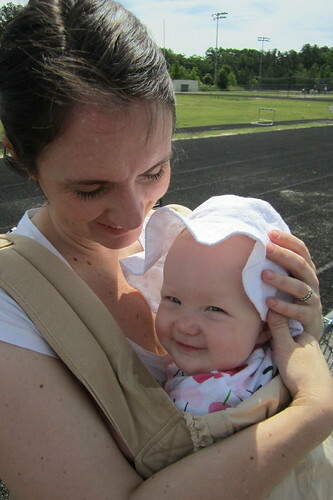 Lauren spent most of the day in the stroller but when she got a little fussy, I'd put her in the ergo. 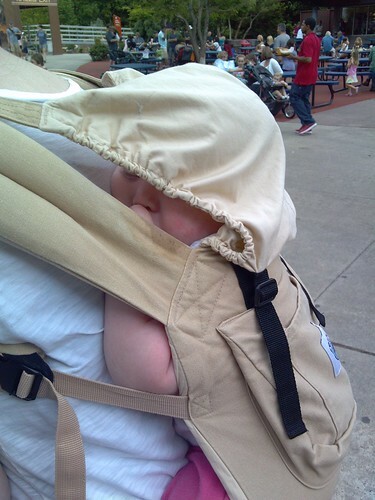 I switched the carrier from her usual front-carry position to my back. She apparently was quite comfortable. Matt and I have lived in this state for nearly 17 years (counting college) and neither of us had ever been to the zoo before yesterday. It is an especially beautiful place. 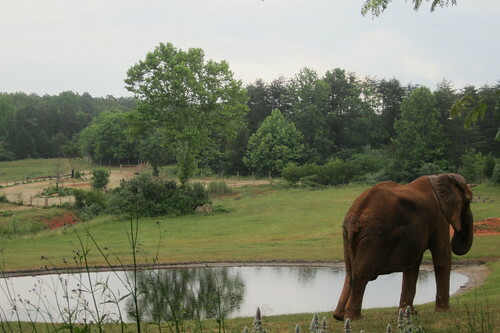 I think my favorite exhibit was the last of the day: the elephants. 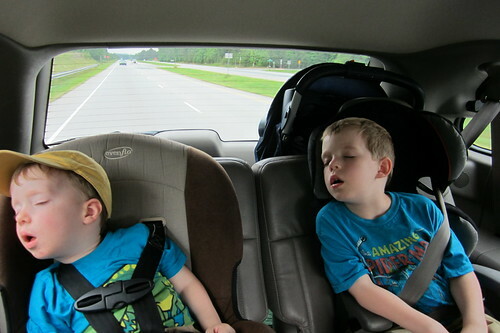 As we drove home on idyllic US-64, the boys slept most of the way--a peaceful, adorable end to a memorable day together. Today I woke up around 6:15, feeling an unfamiliar grogginess--the kind that comes with sleeping nearly eight hours uninterrupted. (Thank you, Lauren.) Also, sleeping past 6:00 was a treat made possible by Matt taking the day off and not having to leave the house at 6:30. This was a fitting start to a midweek holiday. Matt stayed home so I could go to Mom's Day at Tobin's school without Evan and Lauren in tow. He made me a sweet card, handmade picture frame and pretty little "box of hugs," which he told me was something I could look at and hold "but don't even try to open it because I glued over the place where you open it." 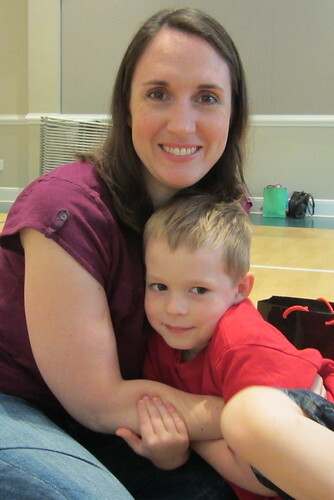 I enjoyed a sweet chapel service with Tobin sitting in my lap, when he wasn't playing handbells with his Kindergarten class. Their performance of "This Little Light of Mine" was the highlight of my morning. 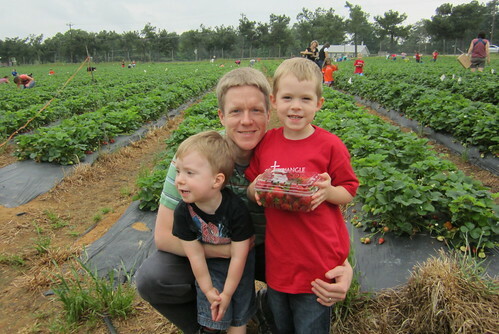 After Mom's Day, we headed back home to pick up the rest of our family to go pick strawberries at Waller Family Farm along with Tobin's school friends and their families. 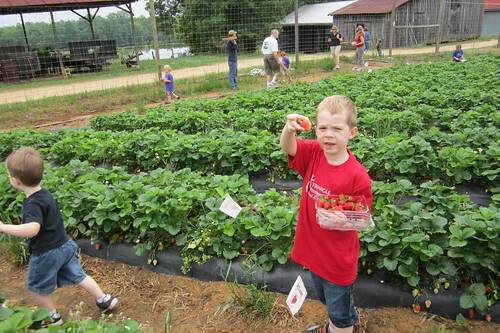 When we first got there, I had to hang back in the van and nurse Lauren, so Matt supervised most of the berry pickin'. 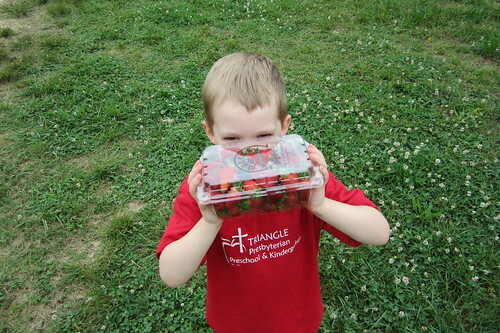 Evan squished quite a few strawberries in his hand while Tobin inspected each one to make sure it was "totally red, not even the slightest bit pink." Evan did come around and enjoyed yelling "Here go, T!" as he handed--or threw--berries into Tobin's basket. After our basket was full, we watched some cows grazing nearby. Evan spotted them early on and kept asking when we could go see them. 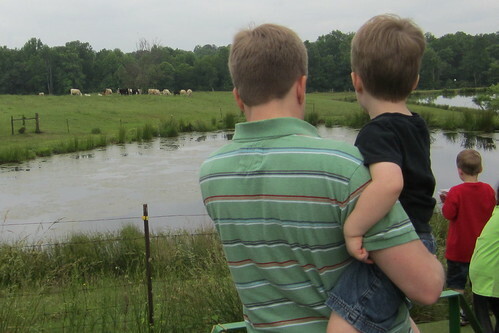 He was curious about why they were all the way on the other side of a pond and asked Matt if "cows go boat?" We left the farm and enjoyed an especially pleasant, peaceful lunch out, then put the babies down for naps when we got home and spent the rest of what turned into a cozy, stormy day together. And we had strawberries for supper. Tobin's birthday month has arrived! 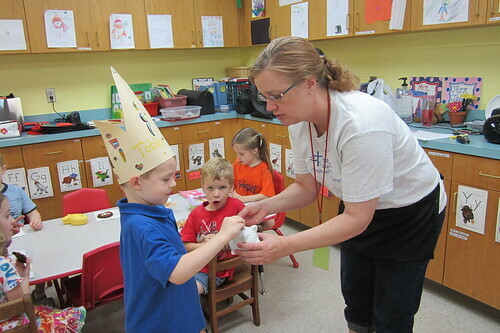 May 17 is his last day of school, so his teacher scheduled his birthday celebration for this past Friday to accommodate end-of-year festivities and other friends' birthdays. With the UNC basketball game in March (an early birthday present from my parents) and our plans later this month, he is set up for a very protracted sixth birthday celebration. He, of course, thinks it's great. 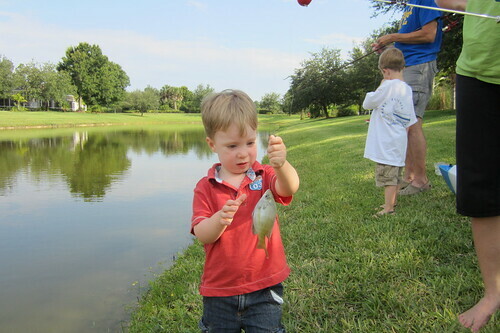 And it helps me ease into the reality that he will be six years old. How in the world . . . ? So on Friday, I visited his class for a little while. When I arrived Tobin was working on an long-term project: a book he has written and illustrated. It's not finished yet but I was pretty stoked to get a preview. Then as he and his friends headed to circle time, he showed me their classroom tadpoles and boasted that there was even a frog! He tried to show me the frog but apparently he's an elusive little guy. 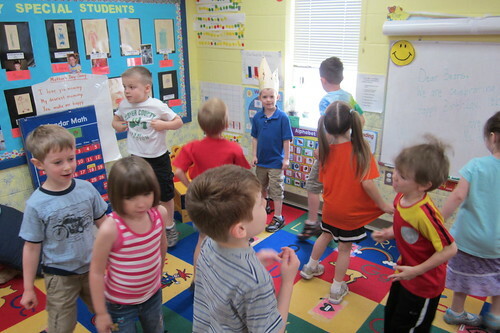 During circle time, he picked the song and danced in his very subtle way alongside his classmates, many of whom were a tad more animated than him. 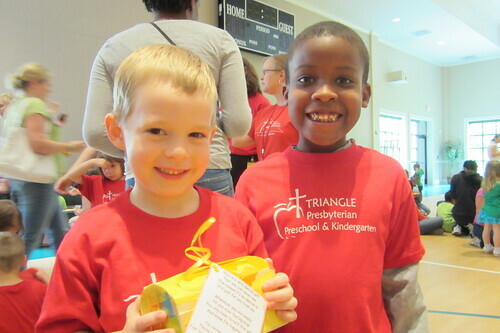 In honor of his birthday, Tobin donated six pennies to a church program called Pennies for Hunger. 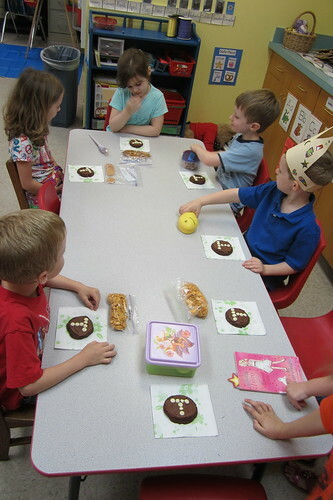 Then he shared some birthday cookies--designed by Tobin, baked and decorated by Mama--with his friends at snack time. This might have been my favorite part of the morning because I got to sit and listen to Kindergarten snack time conversations like this: One of Tobin's friends might have to find a new home for her cat since her sister is allergic to it. This elicited the suggestion from another friend that she could just keep the cat in the attic! But the cat owner wasn't so sure because "It's sooo dark up there!" Another kid chimed in and said that she could just visit the cat and bring him food and water, as long as her sister didn't go up there too. It was all very funny and sweet. 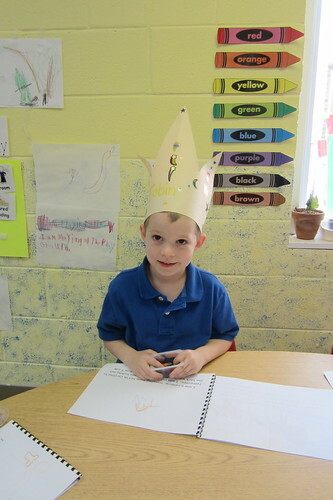 The final part of his birthday celebration involved each of his classmates sharing something they liked about Tobin and illustrating it on a page in Tobin's Birthday Book. I think this is my favorite page. This weekend the Padres faced the Brewers on a cool, cloudy Saturday morning. 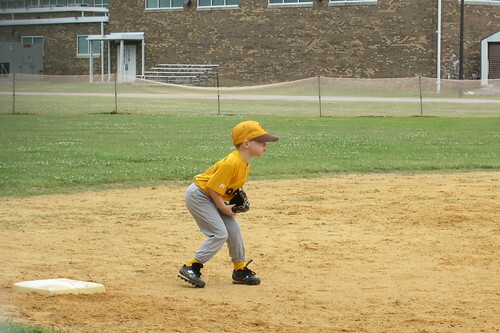 Tobin played third base and fared well, making three unassisted put-outs. He got three hits (didn't use the tee at all!) and scored three runs. 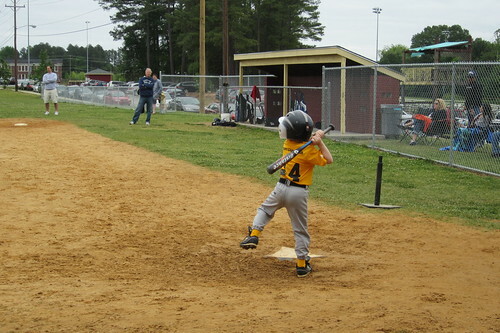 He displayed a batting stance that reminded Matt a lot of Darryl Strawberry. 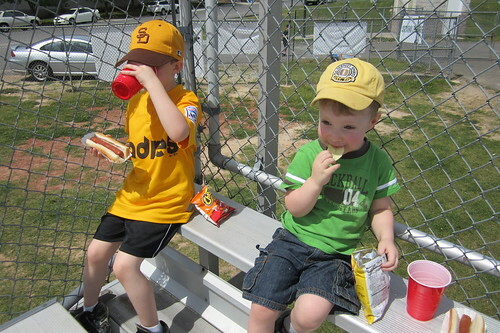 We continue to adore T-ball. Everyone is so friendly and good natured about everything. And it can, of course, be very entertaining too. In this past weekend's game, Tobin was the base-runner on third when his teammate Theo hit a pop-up that one of the Brewer infielders caught! Tobin had already made it most the way to home plate when he realized the ball had been caught. So his first reaction was that he was out too, because he took off his helmet and headed to the dugout. But then he figured out that Matt and Coach Leo were yelling at him to go back to third. He made it back fine, because the fielders were confused too and very belatedly doubled up the runner at first. After the play, Coach Leo asked for a little time and had all the players join him in a huddle on the pitching mound, where he tried to explain what just happened. It was a very funny, teachable moment. More than anything, we're so thankful Tobin enjoys himself so much. We can't help but wish for him to do well but we try very hard to emphasize how fun it is to play, no matter what happens. We love his attitude--he's almost always smiling or laughing--and how he cheers for his teammates from the dugout. In this little video, I love how he smiles after he swings and misses, and how he hustles down the line when he does hit the ball. Just as we made some memories on Saturday with the T-ball game, we had a memorable occasion on Sunday too when we gathered with my three closest friends from law school and their spouses. I can hardly believe it's been nearly six years since we graduated. Our friends Kari and Adam moved to Colorado shortly after graduation, so we hadn't seen them since 2007. They were in town for a couple of days so it worked out for us to get together at our friends Danielle and Mattison's house, where we let our collective brood play while we caught up. Among us, there are now TEN children: ages 7, 5 (x 2), 4 (x 2), 2, 1 (x 2), 10 months and 5 months. Our friends Leslie and John actually have the bookends of the crew--the oldest and the youngest of the kids. We had pizza and lots of good--albeit disjointed--conversations. It was pretty crazy with all the kids but in a really lovely, fun way. 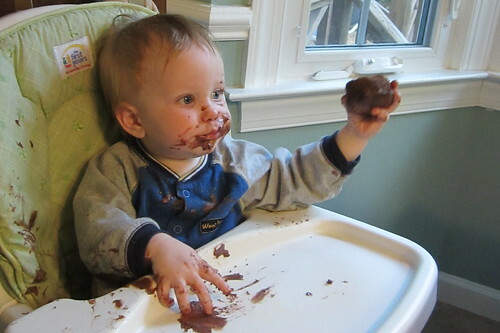 Better yet, it happened to be Kari and Adam's younger son Felix's first birthday. 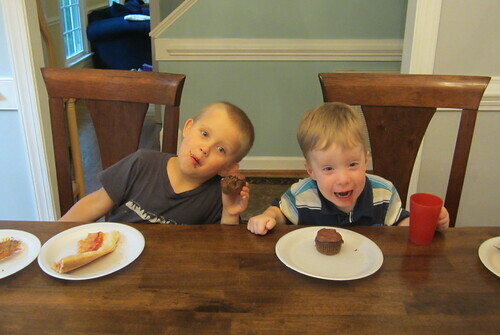 So we celebrated with cupcakes too. Six years post graduation, our lives are very different from what they were. But it also felt very easy to just be together. Kari, Danielle, John and I even had our obligatory, wistful reminiscence about our first-year property class with Professor John V. Orth. We parted Sunday night, promising to not let as much time pass between our next reunion.